Late birdies help Rickie secure win. 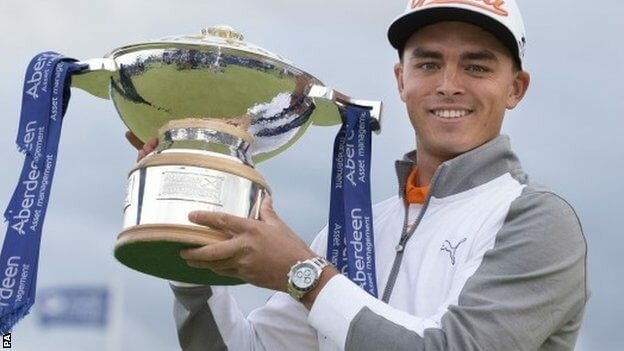 Rickie Fowler’s late surge edged out fellow American Matt Kuchar and Frenchman Raphael Jacquelin as he won the Scottish Open at Gullane. A delightful wedge to within 2ft of the 18th hole set him up for a third birdie in the last four holes to finish on 12 under par, one clear of Kuchar, who shot 68, and Jacquelin. “I had to really dig deep,” said Fowler, who carded rounds of 66, 68, 66 and 68. “I made some great swings coming in. I saved the best swings for the last; I hit a good drive and a great wedge to get to 12 (under). “Jacquelin gave me a scare there on 18. It’s been a special week and I’m looking forward to taking this form over to the Open. Jacquelin had been in a strong position, starting his round on 11 under and keeping it that way at the turn. But a bogey at the 14th dropped him level with Warren, who had finished his round before the wind picked up, and he had to sink a 10ft putt for par at the 16th. With Fowler’s late blitz, the Frenchman knew he had to hit an eagle at the last to force a play-off. His effort was close enough to alarm the eventual winner but he had to settle for a birdie instead. A final-round par would have been enough for overnight leader Daniel Brooks to take Fowler to a play-off but the Englishman’s 12-under-par lead was eroded by four bogeys and he shot a three-over par 73 to finish on nine under. Rickie Fowler has completed a perfect lead up for The Open Championship, and proved once again that he is a formidable force on a links style course. With respectable finishes in the past he would love to go one step further and have his name etched onto the Claret Jug.